Not the best photo but the RECIPE is tops! This week’s post is about potatoes. Easy ones! Flavourful ones! But not spicy ones. Why? Well, my MIL was staying with us for a few months, to spend time with her first grandchild, and I was trying to feed her delicious meals. But with a new baby in the house, they also had to be super-fast meals, because I certainly did not have time to make complicated dishes, not if I also wanted to be able to do laundry, dishes, take care of the baby, and you know, occasionally sleep! So I relied a lot on potatoes. Baked potatoes! Rosemary Roasted Potatoes! Mashed potatoes! Potato soup! Broccoli and cheese sauce topped potatoes! And now, Tex-Mex Potato Wedges! I personally love spicy foods, but the DH and his mum are not big fans of spice. So I had to come up with a way to make them flavourful, but not spicy. And I did! I used a short-cut (taco mix!) to add flavour, and baked them on a high heat so that the outside were crisp and yummy but the insides were soft and fluffy. I served them to my mother and she liked them too, so basically it’s thumbs up all around! The first time I made them I didn’t use enough spice mix, but I did take a photo, the one you see above. The second time I made them, I improved the flavour profile, but didn’t have a chance to take a photo. I was going to make them again and take a better photo, but…I ran out of potatoes! And given that it’s currently minus 16 but feels like minus 22 outside, I didn’t want to send the DH to the grocery store. So, you’ll just have to trust me that these are yummy to look at as well as to eat! Want to make some of your own? Let’s! This quick and easy recipe uses a short-cut to add flavour but not heat. 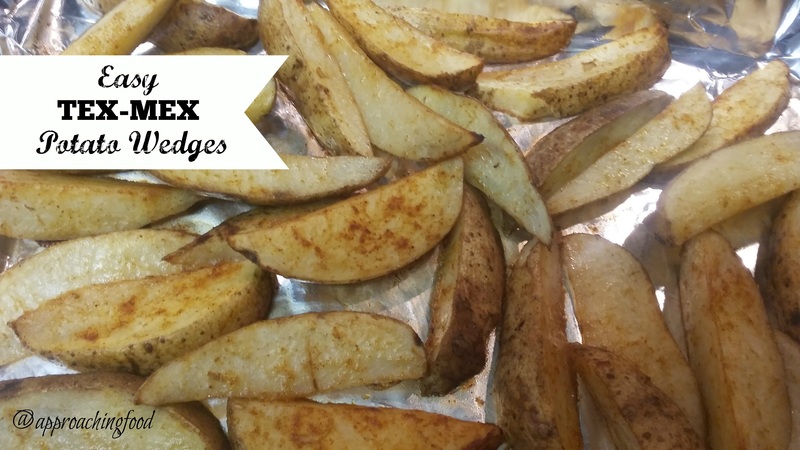 Wash potatoes thoroughly and cut each potato into 8 wedges (cut into half and each half into quarters). Toss potatoes in a bowl with taco spice mix and oil. Spread on an aluminum lined baking sheet, sprinkle with salt, and bake in a 425 Fahrenheit pre-heated oven for 25 minutes or until golden and crisp on the outside and soft and forkable on the inside. I don’t usually advocate adding salt before tasting one’s food, just because most foods are over-salted in my opinion, but I found that these potatoes definitely needed the salt added to them to really bring out the flavour. And I used an aluminum lined cookie sheet to cook them on, just to make for an easier clean-up. Usually I try not to use aluminum if I can get away with it (why waste natural resources is my attitude) but with a new baby, the less time I spend scrubbing dishes, the happier I am! Actually, come to think of it, that’s my attitude in general! Next Post: Hmm. Let me check my blogging notes. Oh yes, maybe a fabulous recipe for an ultra-creamy hummus that is also vegan! So creamy. Have I mentioned how creamy it is? Linking Up at Meal Plan Monday and at Happiness is Homemade! As well as at the Clever Chicks Blog Hop! This entry was posted in Vegetarian Side Dishes on January 20, 2019 by Margaret. What a great idea to season with taco seasoning! 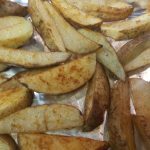 I’m going to try these potatoes in my air fryer. I always enjoy reading your money saving posts on the prudent homemaker site. Thanks, Robyn! Taco seasoning is such a great shortcut, isn’t it? And you can easily make your own if you’re uber-frugal like The Prudent Homemaker!